With the first anniversary of the TV reality show host's presidency upon us, the prospect of socialist revolution, even the very idea of overturning the rule of capital, seems more chimerical than at any time in recent memory. Trump and his plutocratic party are accelerating the transformation of the United States into an oligarchy while further shredding the already threadbare social safety net established under the New Deal. The tide of right-wing reaction isn't engulfing only the US, as elections and other political developments in eastern and western Europe, South America, and Asia demonstrate. A century ago, a party of determined revolutionaries overthrew a corrupt, repressive monarchy to establish the world's first socialist state. Russia's Bolsheviks made a revolution in a vast nation where capitalism was underdeveloped and feudal social relations persisted. Not only that; the Bolsheviks took power while World War I, the first "total" war, was still raging, inflicting technologically-advanced mass slaughter on an entire continent. You couldn't have asked for more inauspicious circumstances for the vast social transformation the Bolsheviks envisioned. 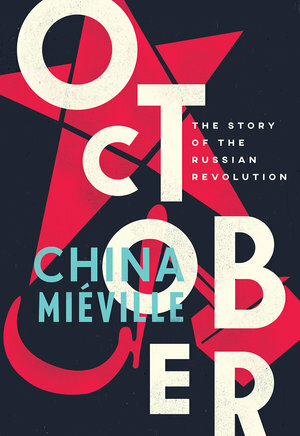 October, by the British author China Miéville, is a gripping account of the Russian Revolution that offers the pleasures and rewards of a great novel. Miéville is, in fact, a gifted fiction writer of mainly science fiction and fantasy. His many works include the novels King Rat (1998), The City and the City (2010), Embassytown (2012), and Railsea (2013), and the novella This Census-Taker (2017). So, the literary brilliance of October doesn't come as a surprise. The book has vividly drawn characters, high drama, suspense, and an irresistible narrative momentum that sweeps the reader along from the first page to the tragic – but not inevitable – conclusion. Miéville also knows his Marx. He's the author of Between Equal Rights: A Marxist Theory of International Law; a founding editor of Salvage, currently one of the best (and most iconoclastic) leftist journals; a former member of the International Socialist Organization; and a founder of Left Unity, a British party affiliated with the Party of the European Left. Mieville's book is a masterful work of synthesis that draws on the vast literature about the Russian Revolution – general histories, theoretical studies, biographies, journalism, and memoirs – by a broad range of writers, participants in the world-shaking events of 1917 (Leon Trotsky), partisans of the Revolution (David Mandel, E.H. Carr), Western journalists (John Reed, Louise Bryant), left-wing critics of the Bolsheviks (Victor Serge) and anti-Communist critics (Richard Pipes, Orlando Figes). The book's "Further Reading" section is, in fact, one of its most valuable, for the citations themselves, many of which will be familiar only to scholars, and for Miéville's critical assessments of the literature. He calls Pipes' The Russian Revolution "fascinating for its details and stories" while deploring "the sheer virulence of its animus against the left." The breadth of Miéville's reading, his judicious evaluations of his sources, and his integration of them into his narrative so that they inform it while never becoming obtrusive, make his achievement all the more remarkable. October begins not with that titular month but with the "prehistory" of 1917, from Peter the Great to Tsar Nicholas II. Under the Tsarist autocracy, Russia's peasants were "entrenched in a rigid system of feudal serfdom" that endured "well into the 1800s, lifetimes after Europe dispenses with it." (Miéville's description of the oppression of the peasantry drives home how desperately that class needed a revolution.) After "waves of peasant riots and rebellions," Alexander II, in 1861, emancipated the serfs from their obligations to their feudal landlords. During the late 1800s, seeds of socialist revolution sprouted in the countryside (the Russian peasant communes prefigured agrarian socialism) and in the cities. In 1882, Grigory Plekhanov and Vera Zasulich founded Liberation of Labor, the first Marxist organization in Russia. In 1897, the tsarist government banished a young troublemaker named Vladimir Ilyich Lenin to Siberia. The following chapters chronicle the tumultuous events from February to the Bolshevik triumph in October. (Although some literature gives the date of the storming of the Winter Palace as 5 November, Miéville follows the Julian calendar, used in Russia until 1918, according to which the revolutionaries triumphed on 26 October.) Each of the chapters is titled after and organized around a month, from "February: Joyful Tears" to "Red October". In each, Miéville masterfully dramatizes the contingency of unfolding events while making the reader feel their inexorability. In June, for example, World War I "crawled on", as Alexander Kerensky, the liberal leader of post-Tsarist Russia, persuaded the All-Russian Soviet Congress to continue the conflict, over the opposition of Lenin and the Bolsheviks, who favored "revolutionary defeatism", a stance Miéville describes as "a socialist advocacy of the defeat of one's 'own' side in an imperialist war." At the same time, the "two great wings of social democracy were moving further and further apart", as the Bolsheviks, the majority party, and the Mensheviks, the minority, increasingly clashed. But by the end of the month, Kerensky's escalation of Russia's involvement in the war had collapsed, along with his reputation and following. Then, four months later, Lenin, armed with the revolutionary theses he developed while in exile, arrived in Petrograd. Early in the morning of 26 October, the Second Congress of Soviets approved Lenin's manifesto proclaiming Soviet power and a new, revolutionary government took power. Miéville offers lively and perspicacious portrayals of the revolution's leading dramatis personae, Lenin, Trotsky, Alexandra Kollontai, Kerensky, and Menshevik leader Julius Martov, among others. He's particularly good about the two bitter antagonists Lenin and Kerensky. Miéville acknowledges Lenin's genius as a strategist and tactician, his acute sensitivity to the historical moment and its possibilities. But the author also presents a Lenin who makes mistakes and won't acknowledge them, who misjudges the revolutionary process and is more cautious and less radical than the Bolshevik rank and file. Workers, peasants, soldiers, and sailors demanded the destruction of the old order and its replacement with a new, socialist one. But as Miéville recounts, the leftist parties – Mensheviks, Social Revolutionaries, and even Bolsheviks – at times vacillated and hesitated to take power. The "masses" could be more revolutionary than the revolutionaries. Kerensky, the leader of Russia's liberals, in a scathing depiction that at times verges on the comic, is vain, egotistical, and inept, always ready to compromise with the revolution's enemies. He is ultimately swept aside by developments he foolishly thought he could control. Rather than Lenin or Kerensky or any other individual, it is the revolution itself that is the real protagonist of October, with all its advances and reversals, its successes and missteps, and its tragic degeneration under war, counterrevolution, and authoritarianism. In the book's epilog, Miéville offers an assessment of the revolution's aftermath that is clear-eyed, unsparing, yet nuanced. He rejects the commonplace claim that the revolution's degeneration was inevitable. "October is still ground zero for arguments about fundamental, radical social change," he writes. "Its degradation was not a given, was not written in any stars." First, the Treaty of Brest-Litovsk, which in 1918 ended the war between the new Soviet government and Germany and its allies, imposed "shockingly punitive terms" on Russia, which gained peace at the cost of losing "swathes of land and population, some of its most fertile regions, and vast industrial and financial resources." In those territories, the Central Powers (Germany, Austria-Hungary, the Ottoman Empire, and Bulgaria) installed "counter-revolutionary puppet regimes". After World War I, there were leftist uprisings in Germany, Austria, and Italy. A soviet government came to power in Hungary. But by 1919, the revolutionary wave was crushed and right-wing reaction set in. German Social Democrats murdered the Marxist revolutionaries Rosa Luxemburg and Karl Liebknecht and suppressed their Spartacist rebellion. The Bolsheviks, who well knew that the success, no, survival, of their revolution depended on similar successful revolutions elsewhere in the capitalist world, found themselves thoroughly isolated. In May 1918, the newborn Soviet Union was engulfed in a civil war; from then until 1921, the Bolshevik government fought various counter-revolutionary forces armed and funded by foreign powers, including the United States. By 1919, Russian territory was occupied by American, French, British, Japanese, German, Serbian, and Polish troops. The so-called White forces engaged in "indiscriminate butchery, burning villages and killing some 150,000 Jews in enthusiastic pogroms." In response, the Soviet government unleashed its own Red Terror. There is no doubt, Miéville writes, that its "reach and depth" expanded "beyond control". Still, the Bolshevik terror, as deplorable as it was, paled in comparison to the atrocities committed by the "White" forces. As the commander of American troops in Siberia acknowledged, "...the anti-Bolsheviks killed one hundred people in Eastern Siberia to every one killed by the Bolsheviks." During the civil war, the Soviet government imposed a range of emergency measures known as "War Communism"/ From 1921 to 1927, the government replaced them with the New Economic Policy (NEP), which permitted the operation of small-scale, profit-making businesses and other liberalized economic measures. The NEP, a "necessary retreat", brought some stability and increased production, but it came with a cost: bureaucratism, and a Communist bureaucracy "suspended... above the broken remains of the class for which it claims to speak." A leftist opposition arose, but in 1921 the Tenth Congress of the Communist Party prohibited factions, a decision Lenin supported. As the noted Trotskyist Ernest Mandel later observed, this was a major error; what was needed at the time was not less internal democracy but more. From 1924 (the year Lenin died) to 1928, infighting in the Communist Party grew more bitter; Trotsky's Left Opposition was crushed by Stalin, who quickly consolidated his power. Miéville asks the necessary, and oft-raised question – "did October lead inexorably to Stalin?" His answer satisfies this reviewer. Partisans of the Russian Revolution must engage with its failures and crimes. "To do otherwise is to fall into apologia, special pleading, hagiography, and to run the risk of repeating such mistakes." Miéville doesn't shy from sharp criticism of the revolution and its leaders. The Bolsheviks faced "objective stresses" (invasion, war, counterrevolution) but subjective factors – the decisions made in response to the stresses – led to the degradation of the revolution's hopes and achievements. There was no teleology leading from October 1917 and culminating in the gulags. As Miéville concludes, "the specifics of Russia, 1917, are distinct and crucial." "It would be absurd, a ridiculous myopia, to hold up October as a simple lens through which to view the struggles of today." That momentous month, "for an instant", showed the world "a new kind of power" – workers won control over production, peasants gained land, women and men enjoyed equal rights in work and marriage, education became free and universal. These advances, which the Russian Revolution fleetingly achieved, remain the desiderata of untold millions, in a world where radical social transformation is desperately needed but whose prospects seem ever more remote.